Another playdate with Buzz and Woody! Ah memories! Looking back I had fond memories of the Toy Story 2 game on the original Playstation with its fun gameplay and great graphics. However, time has not been kind to the game and thanks to the PSN a recent play through revealed that memories can’t always be trusted and some things are better left in the past. The graphics have aged badly and the gameplay feels so stiff that I wondered how I ever considered it playable let alone fun. 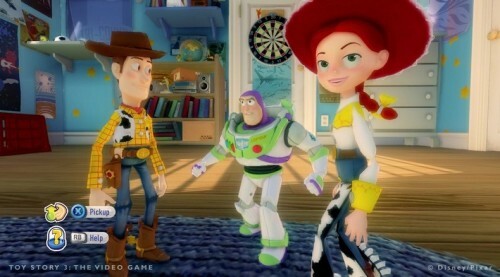 So with my happy memories duly crushed I was greatly excited when Disney announced the multi-platform release of a new Toy Story videogame to launch alongside the third film in the series. After months of anticipation I was quite literally like a little kid at Christmas when I finally got hold of the PS3 version and hoped that this was one movie tie-in that would live up to expectations in a genre where games often go to die! 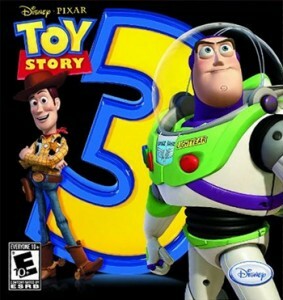 Developed by Avalanche Software alongside the Xbox360, Wii and PC versions the Playstation 3 version of Toy Story 3 is distinctly a game of two halves, part platformer and part open world experience featuring a Sims-like play area for players to build upon and explore. 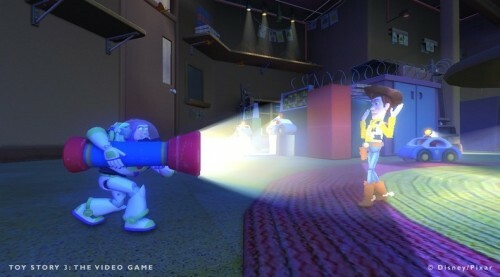 The game does not strictly follow the narrative of the movie choosing instead to expand on certain story elements to give players a unique, varied and spoiler free Toy Story experience. After a couple of fairly mundane loading screens and a brief introduction you are thrust straight into the game. The opening level is an all out wild west action adventure sequence which sees you, as Woody, trying to save a runaway train full of orphans whilst avoiding UFOs, alien attacks and the crumbling mountainside. After the blitzkrieg of this opening you are transported to the game board where you can choose to continue playing through the varied missions that make up the story or alternately head straight into the Toy Box mode. With source material loved by all ages Avalanche has aimed to create a game that has true mass market appeal but therein also lays its biggest flaw. 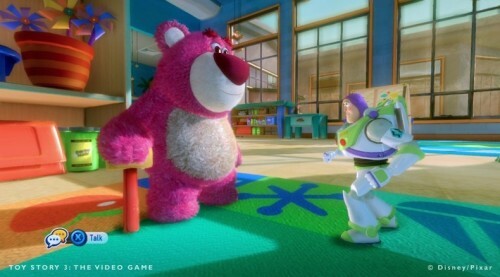 In trying to cater for everyone Toy Story 3 occasionally proves unbalanced with some areas far too easy and unsatisfying for older players and others just plain frustrating, particularly for younger players. Testing elements include a somewhat dodgy camera that fixes in unusual places making progress harder than it need be and occasionally unresponsive controls which see characters bouncing straight into walls for example rather than grabbing onto them as required. Whilst the difficulty level can be something of a roller coaster the frustration is quelled by the titles charm and roadblocked players can always entertain themselves in the Toy Box until a solution comes to mind, blood pressure returns to normal or adult help becomes available! In story mode, the level set in a day care facility proved particularly tricky due to a wayward camera which seemed unable to angle itself in a position that was even remotely helpful. This level focuses on stealth with the player required to be on their toes whilst speedily slipping past moving patrol vehicles and avoiding nefarious toys acting as spotlights. One wrong step puts you right back to the beginning of the stage and due to the dodgy camera luck plays a huge part in how many attempts it will take to successfully progress making the experience repetitive. On the flip side the amazing opening level is a real treat as is a later stage that sees you flying through space as Buzz Lightyear, zipping around asteroids and blowing up fast approaching robots with your arm laser. Another fast-paced level had Woody and Jessie attempting to free Hamm and other characters from a conveyor belt rapidly heading for the garbage disposal, prompting a sense of urgency and giddy excitement as you try and save the plastic pigs bacon! 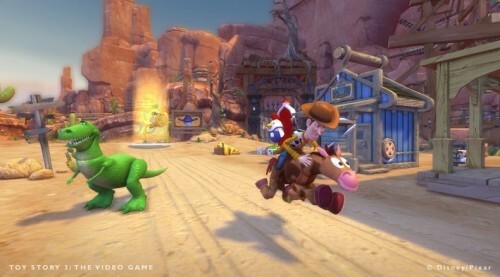 The much heralded Toy Box mode places you in an open world western themed Sims style affair. 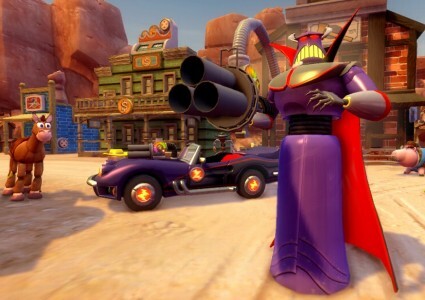 Here you will find numerous characters to interact with including many familiar faces notably little green aliens, Sticky Pete and, exclusively on the PS3, the evil Zurg from Toy Story 2 who is unlocked after enough coins are earned. Despite its free-roaming appeal there are also plenty of structured missions available in this mode. Playing as Woody, Jessie or Buzz you are the town’s sheriff and as such residents will often call upon you for help and assistance in everything from painting houses and finding lost items to rounding up criminals and rescuing Mayor Hamm (again)! The quests in the Toy Box mode are structured in such a way as to ease you into the range of activities and controls available to you and encourage experimentation. That said there is still a fair amount of text to deal with so younger children might find they become stuck if left alone, at least during the first couple of hours play. With multiple quests unlocking as soon as one is finished there is very quickly plenty to do and see but I still feel that younger players may be somewhat overwhelmed without guidance and it’s not as immediately intuitive as say the Lego games although both encourage cooperative play. To the game’s credit younger players can simply ignore quests and choose instead to play around with interior and exterior design, dressing up characters, driving, racing, exploring or just generally causing mayhem! 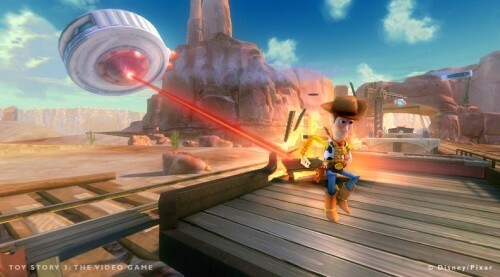 Players will find that Toy Box mode rewards experimentation and the longevity of the game is increased exponentially as a result. It is a very welcome addition to what could easily have been an enjoyable if short lived movie platformer and it could be argued that this is indeed the true heart of the game as it will undoubtedly receive more focus from many players once the story mode is bested. Lackluster menus and loading times aside, Toy Story 3 is both polished and enjoyable with plenty to recommend and little to dissuade fans of the seminal motion picture trilogy or lovers of slick platforming adventure fare. The occasional tough level in the game’s story mode is counterbalanced by the inclusion of infinite lives and there is plenty of enjoyment to be had in this portion despite the short duration. 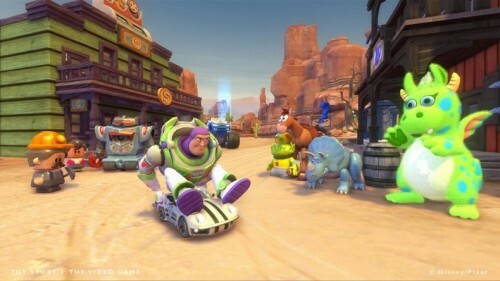 The inclusion of the Toy Box mode is something of a masterstroke which should see players of all ages continue their Toy Story experience long after the platforming is forgotten. Non-linear and full of exciting possibilities it is the video game equivalent of an ongoing shopping spree at Toys R Us and the game offers you a rich and rewarding play area in which to interact, build, develop or simply just goof off to your heart’s content. Throwing aliens into the town’s hairdressers only to find them exiting sporting a Elvis lookalike wig in this mode is more than worth the occasional gnashing of teeth and controller crushing as you attempt to grab collectible items in the story section! Catching robbers and throwing them in jail has also proven a fun activity amongst the little ones and the realisation that I was trying my best to hog the controller away from them for ‘just one more go’ is all I need to give this game a big, hearty recommendation. Toy Story 3 beautifully captures the well loved Disney/Pixar characters with an attention to detail that not only brings them to life but keeps you compelled to stick around with these ‘old friends’ rather than leave them dangling midway through a level. Movement is fluid and voice acting absolutely spot on with everyone behaving exactly as you would expect. With its superb character animation, colourful scenery and bags of atmosphere this is certainly a game that no self respecting Toy Story fan should be without. 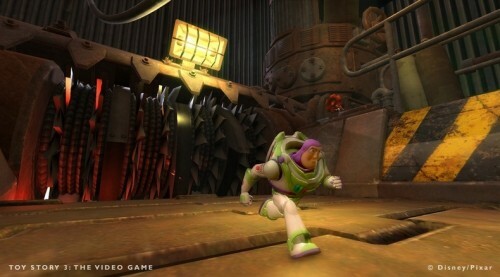 Woody, Buzz and the rest of the Toy Story gang are waiting for you now on all formats. The PS3, Xbox360, Wii and PC versions were developed by Avalanche Software. The Nintendo DS version was developed by n-Space with Asobo Studio behind the PSP release.